My mother recalls her early years in Blaenau Ffestiniog, and Dolgarrog. She writes about the disaster which struck the village in 1925.
married Jean and her husband Bill. I was born in Blaenau Ffestiniog, the third daughter of Owen John and Sarah Michell Roberts (neé Jenkins). My father came from Penmon, Anglesey, and mother from Blaenau. I am writing down events of my life which might be of interest to you! Memories of my very early childhood and the following years. My first memory is of me sitting in my 'chair pram' at the foot of the stone or slate steps leading to my home - a flat above a shop at the start of Church Street in Blaenau Ffestiniog. I was waiting for my mother who had gone back into the house for something. As I sat there, I could hear a noise which got louder and louder, until 'it' passed me. It was the Blaenau Ffestiniog Brass Band playing and marching. I had such a fright with the loud sound, that to this day (January , Sunday the 14th, 2007) when ever I happen to be outside I hear a Brass Band coming and going, I feel a cold shudder passing through me - not so on the television or radio! When living in the flat, I was about 3, I remember my father had made a swing for us with a thick cord and just in case we fell off it, he had placed a thick mattress below, so if we fell off, we would land in comfort on the mattress. I used to carry a little clock from one of the bedrooms and walking along the corridor, I would swing the clock, banging it on the walls either side of me, before going into the kitchen. One day as I was doing this, I saw my mother looking at me through the window. She had taken my sisters Betty and Myfanwy safely across the road to school. The door had closed and she could not get back in. She called me to get a chair and put it against the wall and reach for the key. This I did - stood on the chair, but could not get hold of the key - the rest is blank. Mother told me she went to the shop below, and somehow the owner came up and managed to open the door. Another Memory is of me walking down the steps onto the street and trying to get into a car which seemed huge - it had what seemed like a material cover, which was drawn back. It was the folded roof of the car. I sat down, and that's it. Betty and Myfanwy were infected with smallpox, but it appears I was not strong enough to have the immunisation injection, but shortly afterwards, it appears, I became very ill, and the doctor did not know whether I had chickenpox or smallpox. I was in a cot in a darkish room and two men were looking down at me. One of them, the doctor, was examining me, looking at the rash, the other was my father. I said 'Stop it Daddy' but it was the doctor checking the rash. However, I survived. There was a girl named Tegwen living about four doors away from our grandparents home in either Jones Street or 2 Taliesin Terrace. She was about 15 years of age. She was a lovely person and seemed to be around us a lot - my two sisters Betty and Myfanwy. Our pet names were Betty -Betsan, Myfanwy - Ha Hoo, me - Pink Pank and my dear brother Eric - Pom Pom. I think Tegwen was paid a small sum to look after and entertain us when stayed with Taid and Nain, who were such lovely people. She took us for walks and especially to a small hill behind the house. We loved going there and could see Blaenau and various hill around. There was also a clump of stones there called Cader a Sofa - large boulder shaped as a chair / sofa or couch, and behind it a cot, all on stone. No doubt they are still there. We also collected heather and moss and made flower arrangements. Our bedroom faced towards the slate quarry and I could hear slates sliding down the hillside from time to time and I could hear the workmen leaving home and going to the quarry. To the left, looking towards the quarry, there was a mountain. The only memory I have of it is its darkness at all times. It was like 'The Valley of the Shadow….'. As a child, I did not like at all. However, I loved going to Blaenau, where I was born. 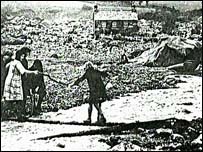 I was about 4 years old when we left Blaenau Ffestiniog to live in Dolgarrog around 1932. My father came to work at the Aluminium Works, pictured below. I remember my first visit to our home, 26 Gwydr Road. It seemed huge and empty. Obviously the furniture van had not arrived, but we children were very thrilled with the house. It had three bedrooms and bathroom upstairs, a kitchen, pantry, spacious hall, living room and parlour. My father turned our back garden into a productive kitchen garden with fruit and vegetables, with a lawn and flower garden at the front. Above: 26 Gwydr Road, Dolgarrog. This shows the house and wooden fence, before the road was altered. It is at the far end of the Gwydr Road colour postcard picture (below, after next story). 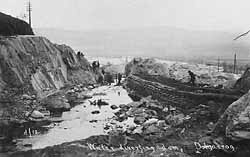 I can remember the current road running through Dolgarrog being built, with lorries and steam rollers working hard all day. There existed only a rough track outside our home then, muddy at times with several large stones or boulders visible. The main road was below that, and ran past Tan Y Ffordd farm. The first infant school I attended was called The Aviary, situated opposite the Royal British Legion Club and up a narrow hill. Turning right, it was on the left. It consisted of only one room. It eventually became our Methodist Sunday School and prayer meeting place. The Band of Hope was also held there. The older children went to a school called 'Sillens', opposite E. B. Jones stores on the main road. I recall using a thin slate to write on with a slate stick when I later attended there. The school property and land no doubt belonged to the Aluminium Corporation Limited, and years later it became a medical clinic for mothers and their babies. Above: Old postcard E B Jones shop. Dolgarrog School on the left, with the village in the distance. I remember the new Central School being built - it was in the shape of an 'E'. As a pupil there I recall the teaching was superb. We had an infants section, cookery room, and held assemblies, short services, in the main hall, which had a kitchen at the back and tables for school dinners. Music lessons were also held in the hall where we learned about Handel, Mendelssohn, Schubert and others. We had a laboratory and woodwork room where I made a wooden mouse. We also had shorthand and typing lessons. The headmaster Mr Darfyl Humphreys, later retired to Blaenau Ffestiniog. On St David's Day, we held the School Eisteddfod. The school 'houses' were named after local lakes; Cenin (yellow), Crafnant (red), Cowlyd (blue) and my 'house' Dulyn (green). In our Girl Guide uniforms we attended the Armistice Day service in November at The Royal British Legion's Cenotaph. Mr Bert Williams led and conducted the children's concerts and choirs, accompanied by Madam Olwen Hughes, a pianist and singer. These were held at the original cinema which was also a dance hall. We saw many black and white films there, and the serial Flash Gordon's trip to Mars. I loved listening to Saturday Night Theatre on the radio. One play was called Ladies in Retirement which was later made into a film, and I was all excited when I heard that the film was coming to Dolgarrog. Unfortunately, the cinema burnt down a few days before it was due to be shown. We left school at 15 in those days, unless you passed the scholarship when 11 years old and carried on your education at Llanrwst Grammar School. When walking to school I'd cross a bridge and looking down, I could see and hear the 'bogeys', which were trucks carrying workmen to the Hydro Electric Scheme up the mountain. The bogeys were attached to a thick black cable and came down the incline. There were also steps alongside giving people the opportunity of walking up and down. Near E.B. Jones was another bridge which went over huge black pipes coming down the mountain, on a very steep inclination. I recall once climbing over the bridge and on to one of the large pipes - it took me a long time to come down from it! We used to walk from our home 26 Gwydr Road across the valley and along the straight road called The Track with bushes either side and cross a wooden bridge to the small station. The Aluminium Corporation's railway track ran alongside it on the left. From the Track, we could see the village houses with their red tiled roofs. In winter the streets were lit up, as was The Track. Trees have now grown to block the view of Dolgarrog. At Dolgarrog Halt, pictured above, we caught the train to Blaenau to visit my grandparents, Richard Jenkins, or 'Jenks', a caretaker at Blaenau school, born in Trisant near Aberystwyth, and Elizabeth Jenkins neé Michell, who hailed from Cwm Ystwyth. It was so wonderful, stopping at various stations, all clean and tidy with little flower gardens decorating the platforms. Then off again to Blaenau through the long tunnel. Sometimes the light would go out in our carriage and we were in complete darkness. My dear father would light a cigarette so that we could see 'light' in the pitch black darkness, which went on for quite a few minutes - but I felt no fear, because Dad, Mam, two sisters Betty and Myfanwy and dear brother Eric were there. Then we came out of the pitch darkness into the light, and were a few minutes from my dear Taid and Nain's home - absolute magic for me. My Taid and Nain Blaenau visting our home in Dolgarrog. When it rained heavily, the Conway River flooded. From our small landing window, the valley appeared to be a sea of water all the way to Trefriw and beyond. Water would also come down in torrents from the vicinity of the broken dam. I remember one occasion, relatives of mine journeying up the Conway River from Penmaenmawr to Trefriw in a pleasure boat, and we threw them a bunch of our garden flowers which they picked up and we all waved at each other. My mother could play the piano and when we moved to Dolgarrog to live, as she played the piano, I would march around the table pretending to be a soldier marching. Little did I think that in years to come, I would watch real soldiers marching through Dolgarrog during the 1939 - 1945 War! The piano sessions took place in the front room or parlour. We were not allowed to play there - it was kept for special occasions such as Christmas, when it had a lovely coal fire. The large oval mirror which hung on the parlour wall is now here in my home, and I remember on my Wedding Day, looking at myself in the lovely mirror and saying 'Today you are going to get married to Bill'. Roberts Family.c 1947 at 26 Gwydr Road. Written by Jean Davies for her granddaughter Kim Davies at Newtown in 1998. I was only a young girl at the start of the War, and didn't know what War was until my parents explained it to me. In the village where I lived, Dolgarrog in the Conwy Valley, there is a large Aluminium Works and also a Hydro-Electric Power Station. I understand that the Germans were aware of this fact, and they intended to bomb them. The Works was therefore camouflaged to disguise it from the views of the German aircraft pilots. Its roof was made to look like fields, and houses were painted on the sides of the buildings to confuse the enemy. Our homes were also camouflaged. Llanrwst Grammar School had a foreign teacher. I was told that one day, she asked all the children to draw a map of the River Conway, showing where various places were. The river flowed very close to the Dolgarrog Aluminium Works. Shortly after that, the teacher did not appear in school again. Perhaps she was a spy, obtaining information for the Germans! Above: 'May Queen' - Betty Roberts, Myfanwy Roberts, Rhiannon Evans, Jean Roberts, Joyce Carpenter, Jean Jones, Margaret Roberts, Glenys Jones, May Queen Gwyn Davies, Mary Jones and Moira (?). Betty and Jean Jones decided to have a May Queen and arranged the event with the girls. It was held in the garden of 26 Gwydr Road. They borrowed the 'crown' for the day from neighbour Mrs Hughes at No 27, whose son had won it. Gwyn Davies was chosen as the May Queen. When the air raid sirens rang out and we were in school, we all left very quickly to safe houses in the nearby village, for fear that a bomb would fall and destroy the school - and us too! Fortunately this never happened. In the air above some nearby lakes, were air pockets, and if a plane flew through one of them, it would immediately lose altitude, and drop to the ground like a stone. The pilots would die. Many years after the War, the remains of crashed war planes were discovered. Soldiers lived in our village in specially made huts, and there were several bunkers throughout the area where armed soldiers stayed. I remember large tanks travelling through Dolgarrog every Thursday, creating large holes in the road as they passed by. We children waved and shouted hooray at the soldiers who were in them and the lorries which accompanied the tanks. One day, our spaniel Jet went barking towards them. The tanks stopped and the soldiers all laughed to let Jet cross the road. We could see searchlights from as far away as Liverpool at night, trying to pick out German bombers. The sirens sounded most nights and we could hear various places being bombed. As schoolchildren, we knitted scarves for the army and the school forwarded these on to the soldiers to keep them warm on the battlefront. Above: Dolgarrog Central School c. 1940. Top L-R Rhiannon Evans, Josephine Watson. Olive Roberts, Gwyn Davies, Drina Scott, Jean Roberts, Bessie Bell, Jinnie Griffiths, Nora Spencer. Middle L-R Annie Williams, Betty Davies, Joan Williams, Mary Coates, Betty Evans, Mildred Griffiths, Sally Shields, Audrey Baddley, Margaret Roberts. Bottom L-R Glyn Roberts, Norman Evans, Gordon Jones, Ken Griffiths, Huwie Williams, Ken Carpenter, John Roberts, Jacky Bohanna. Food such as butter, sugar and tea was scarce as were other items during the War. My father grew several vegetables in his garden and my mother did justice to them with her cooking. The shops were very short of 'nice things' and everyone had a Ration Book, which had a personalised number. My number was ZEIH/235. Very few sweets were available. There were many War posters on display throughout Dolgarrog. The ones which stay in my mind are "Make do and Mend" and "Careless Talk Costs Lives". I recall mending and re-mending our clothes and my father repaired our shoes. He was in the Local Defence Volunteers, renamed the Home Guard, having fought in the Great War of 1914-18. Each home had dark window curtains to stop lights showing at night. If there was a light, a policeman or a Home Guard soldier would knock on the door and give us a row. My father built an Anderson shelter in our back garden. Despite all this, we children remained happy, not fully appreciating the situation, but we were extremely happy when the War came to an end. Above: Gwydr Road, Dolgarrog, in days of peace. My sister Betty married Alvin Gaetz a Canadian, and emigrated to Canada. I remember her sending a box of apples from Canada to us one Christmas. My father decided to try and grow some apples from the pips. He put them in pots until they grew, and his brother Jabez came over for the day and advised my father to graft them on to existing apple trees. He offered to do this for my father, from apple trees he had at Cae Merddyn. Once grafted, and ready, they were removed from Cae Merddyn and brought to 26 Gwydr Road, where my father planted them in the back garden (above). In the course of time, the apples grew and we enjoyed eating them for many years after. Our own flavour of Canadian/Cae Merddyn apples. "Christmas is coming now, and there are a lot of children who will not be having any toys, because the factories have been taken over to make munitions for the War." My father had come home that evening from the aluminium works in the small Conway Valley village of Dolgarrog where he worked in the rolling mill.The Second World War was in its 2nd year. I was 13 years old. Times were hard, and our parents had made many sacrificies to ensure that we were adequately looked after at home with rationed food, clothing and shoes. There were many children a lot worse off than my two sisters, brother and I. I thought of how I would feel in a home at Christmas without toys. "I've seen an appeal in the local paper", my father continued, "for unwanted toys. Jean, you're getting a bit old to play with your doll now. Will you let another little girl have her, so she can enjoy Christmas?" I reluctantly agreed, and went to my bedroom to have, another look at the doll. My doll was some 18 inches high, with a head made of china. Her four teeth had fallen into the shell of the doll, and it consequently rattled when shaken. The tip of her small finger on her left hand had broken away. I loved my doll, who I named Shirley, after Shirley Temple, the child actress. I couldn't imagine what my life would be without her, but took consolation in the fact that someone else would hopefully be as happy as I had been with Shirley. My father placed an advert in the paper, giving our details. A few days later, a lady from the Colwyn Bay area of North Wales, called at our home to see Shirley. She liked her and took her away. The years went by, I married and moved to live in South Wales. One day, while chatting with a close friend, we talked about the war years, when we were children. My friend related the tale of how she had received a doll one Christmas when she was about 8 years old. She knew it wasn't a new doll, because her teeth were missing, and they rattled inside her, and the tip of her little finger on her left hand was missing. Her head was made of china. I couldn't believe my ears. She had described Shirley, the very doll I had given away all those years ago! I told her my story, and my friend then confirmed she had indeed lived in Colwyn Bay at that time, the town from which the lady had called to our home in 1940 to take Shirley. We are convinced it was the same doll! Supplied by Jean Davies (neé Roberts) based on an article received by her. 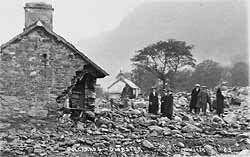 On the night of the 2nd November 1925, the hydro-electric schemes upon which Dolgarrog in the Conwy Valley depended, gave rise to one event which was to produce both tragedy and National headlines. After prolonged rain, the dam at Eigiau burst, flooding part of the village and drowning several of its inhabitants. The first intimation that the people of Dolgarrog had that something was amiss on that fateful night, was the noise of two loud reports on the mountain high above the village. They were the first warnings of havoc that was to follow almost immediately afterwards, when many gallons of water poured, first from Eigiau Dam into the reservoir Coedty and from there onwards down the valley. 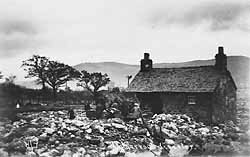 The first impact fell on Rose Cottage and three houses known as Machno Terrace and seconds later, numbers 1 and 2 Bungalows, the Church and the Junior School were swept away, as were Tai'r Felin and Porthlwyd Cottage. 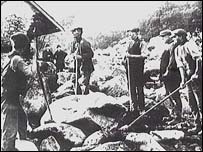 A section of the Conwy to Llanrwst road north of Dolgarrog was also washed away. Because of the large number of contractors employed in the neighbourhood, it was a difficult task to ensure that all persons who might have lost their lives were accounted for. The final reckoning showed that ten adults and six children had perished in the disaster. A cinema show which was being held in the local Assembly Hall undoubtedly saved the lives of many children and adults who would otherwise have been at their homes lying in the path of the flood waters. 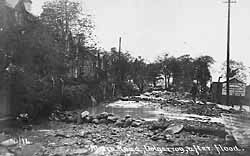 The failure of two dams caused a flood that swamped the village of Dolgarrog in North Wales, killing 16 people. The disaster was started by the failure of the Eigiau Dam, a small gravity dam. The water released from the reservoir flooded downstream and overtopped the Coedty Dam, an embankment dam. 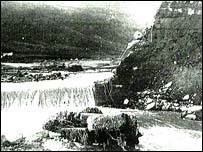 This dam failed, releasing the huge volume of water that flooded Dolgarrog. Although rescue work continued through the night, it was not until daybreak that a search for those missing could be set in motion. All available members of the police force were sent to the area, and hundreds of volunteers anxious to be of assistance turned out to help. All the fields in the valley were covered either by water or thick mud. With many hundreds of large boulders which had tumbled down the mountainside, it seemed miraculous that all bodies were found. Those of the children who lost their lives were recovered from the Conway River later in the day. Although there was not much structural damage to the buildings of Corporatrion Factory at Dolgarrog, the whole area was covered to a depth of about six feet with mud and debris that had been washed down the mountainside, putting all the reduction furnaces out of action and causing extensive damage to installations in the generating station, the carbon factory, rolling mill, recasting shop and the general stores. As late as 10.30 the following morning, floodwater was still running out of the Aluminium factory. Nearby towns of Conwy, Llandudno and Colwyn Bay had been plunged into darkness and work was immediately put in hand to connect the lighting systems with the reserve supply from Cwm Dyli Power Station. The event aroused nationwide sympathy and offers of help came from all directions. It was perhaps fortunate that Sir Robert McAlpine and Sons had a large number of men in the area at the time, and they put their resources immediately to the disposal of the Corporation, firstly to help in the search for the missing persons, and afterwards to clear the area of mud and debris left behind by the disaster. In spite of all the efforts to clean up the premises of the Aluminium Corporation, it was not until eight weeks later that the Directors were informed that most of the debris had been cleared from the immediate vicinity of the works. The Church font was found a few weeks later, and many years after the tragedy, the Church Cross was dug up. Today it is in its place in the Church tower of the present church. An old tramp, Mr Barber, used to walk the length and breadth of Wales at the time. When in Dolgarrog, he slept inside the porch of the Church. On the night of the disaster, he went there but changed his mind and made for Conwy, thus avoiding the tragedy. Y noson hon, nad oedd o fewn y cwm. Jean Davies (neé Roberts) explains that the poem is based on a tramp, believed to be a Mr Barber, who regularly slept inside the church porch in Dolgarrog on his travels. This particular night, he chose to move on towards Conwy. That decision saved his life as the church was washed away by the water as thundered towards the village. The poem was written by her late husband. I married William Owen Davies of Llanrwst. Our eldest son Ken was born when we lived in Dolgarrog, and we then moved to live in Llanrwst where Bill worked at the Post Office. I worked for David Thomas, a Solicitor in the town. 21 Cae Tyddyn (below) was our first home in Llanrwst. It has since been re-numbered 18. Bill got promoted to Postmaster at Dolgellau in 1960, where our second son Paul was born. We moved to Llandeilo in 1970. My parents came to live with us shortly before they died. Sadly, Bill died in November 2002 and I live not far from Paul and his family, with my very happy memories of my life in the beautiful village of Dolgarrog. Loving Mother and Nain, Widow of Bill. Eulogy read by Kim Davies. Born in Blaenau Ffestiniog, Nain spent her childhood in Dolgarrog where her heart lay. She was the daughter of Owen John Roberts and Sarah Michell Roberts, sister of Betty, Myfanwy and Eric. Nain married William Owen Davies and moved to live in Llanwrst where Taid worked in the Post Office and Nain worked with David Thomas, Solicitors. Taid was promoted to Postmaster and transferred to Dolgellau, the family later moved to Llandeilo. Nain's passion was her knitting and she enjoyed sharing this knowledge with us, her granddaughters. As life progressed, Nain moved to Awel Tywi Care Home, where she was very well cared for in her later years. Due to illness, she was admitted to hospital where she died peacefully in Gwenllian Ward, Glangwili, Carmarthen, where she also received excellent care. On a personal note, I would like to add that I'm sure I speak on behalf of us all when I say that we will never forget Nain's warmth, laughter, her kindness and joyful spirit. She meant so much to every one of us, and I know that one day, when Rhian, Rebecca, Bethany and I have children and grandchildren of our own, we will take pleasure in sharing our fond memories of Nain with them. It is reassuring to know that Nain is now reunited with Taid and Sarah Jean. Nain will be greatly missed by our family. ANCESTORS OF DONNA COOPER; This fascinating site contains a family tree with well over 5,000 names. Some have connections with Dolgarrog, Cerrig y Drudion and Llanrwst.